Around Europe there are bronze markers in from of the addresses of those who died in concentration camps. These are a couple doors down from the hotel where we stayed in Berlin. Berlin is a city that “officially remembers.” There is a memorial to the Jews that died in the holocaust. There is a memorial to the homosexuals who were put to death in concentration camps. All around the city are obvious and subtle remembrances of the wall that once separated the East from the West. As there is in much of Europe, there are bronze markers inlaid in the sidewalk in front of the addresses of those who died in the holocaust.` There is even a sign that marks the location of the bunker where Hitler lived out his last days (an appropriately undeveloped site which serves as a parking lot). 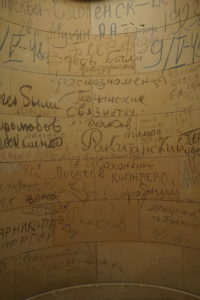 In the latest remodel of the Reichstag the architect Norman Foster even preserved the graffiti the soviet soldiers wrote on the walls with burnt sticks at the conclusion of WWII. Yes, there is plenty that looks beyond these dark past events, but it would be hard to miss their presence. When the wall coverings from a 1960 renovation of the Reichstag were removed architect Norman Foster chose to leave the graffiti left by the invading Soviet soldiers in place in the 1999 (current) renovation. My son Ben was 6 years old when the wall separating East and West Germany came down, so anything other than a united Germany is something that he only knows through history. Kathy and I were 4 years old when it was constructed, so the division between East and West and particularly the Communist terror of the East was the truth we grew up with. My mother was 5 years old in 1939 when Germany invaded Poland beginning the European expression of World War II. It is fascinating how having experienced these different realities influences our understanding. Being born in 1957 means that I grew up with the Cold War. The “Iron Curtain,” otherwise known as the Berlin wall, was the dividing line between ideologies, a separation of people that at the time seemed obvious. This might be a Western view, but it would be hard to miss that West thrived and the East withered. What sat underneath every thing was a great sense that “communism” was an oppressive enemy and that the Berlin Wall in particular, served primarily to keep the East German’s from escaping to the West. At least from a Western perspective, it functioned as a kind of of local containment of the world’s Communist evil. Though this view of communism’s intrinsic evil was fading for me by the end of the war in Vietnam, and the general opening of the east, it was not completely gone. In 1978, one of our classmates was caught trying to smuggle three East Germans out of the country in the trunk of his car and he received a 2 1/2 year prison sentence. We understood this part of the world to be a dangerous place. When the wall came down in 1989, it seemed like an impossible reality. We visited two former SED sites. Hohenschönhausen prison and the Museum “der runden Ecke.” Both seemed like something out of a 1970’s spy movie and both had a peculiar smell which we were told was the smell of East German plastic. It was distinctive and almost 30 years later it is still there. The past has a way of remaining. The University of Potsdam, where my son Ben is finishing his post-doctoral studies, is not an old institution. It was established in the 90’s on the site of a former SED training facility. The original buildings on campus were used to train the Stasi, among the most hated, feared institutions of the East German Government. On the same campus, he works out the inner working of a chemistry that I will never understand. History should be easier, but this is even harder to understand. One of the tallest “mountains” in Berlin is a debris pile burying a former Nazi training facility. 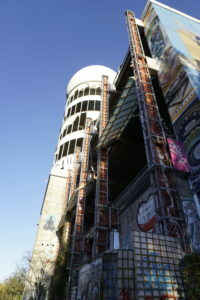 It is now the site of an abandoned NSA listening post turned Urban Exploration destination. I am told there is a controversy in Berlin these days specifically, and in Germany in general about how central all of this corporate remembrance should be? Indeed, it would be easy to miss– the line of bricks inlayed into the sidewalk and crossing the street that marks the location of the wall. Berlin today is a thriving city. Indeed it would be easy to miss that the hill we climbing to an old and abandoned NSA (National Security Administration) listening post built to monitor East Germany, was placed on a massive debris pile that intentionally buried a Nazi training facility under the remnants of the bombed out remains of the city. But Do the Victors Remember? It has long been said that the victors write the history. I think it could also be true that the victors tend to not be bothered with remembering. I have been to the site of Wounded Knee. It is not a likely destination in South Dakota and I suspect most Americans do not even know what the “Trail of Tears” was. We conveniently forget that there were 10 detainment camps scattered across the west during World War II were US citizens of Japanese descent were held, and it is not surprising that there are those who are opposed to the establishment of the new memorial to those who where lynched in Alabama. I have been coming to the North Shore of lake Superior since I was young. The North Shore of Lake Superior is a place that have visited since I was a kid. The Superior 50 mile race was the first 50 miler I knew about. My friend Steve Schuder used to run it back in the 90’s. I had hiked enough of the Superior Hiking trail to know that it would not be an easy trail to run. I remember thinking that it was something I could not imagine doing, so I suppose it is a little surprising that 20 plus years hence, I would be submitting my qualifying races and even more surprising is I would make it through the entrance lottery. This was my 3rd 50 miler and it came at the end of a fairly ambiguous race plan: two 50k’s, a 380 mile gravel bike race (that I called at mile 190), a 340 mile canoe race, and then this 50 miler with its well known roots, rocks, and 12,000 feet of vertical. The truth is I was a little off my game in terms of motivation by the time September and the race came around. 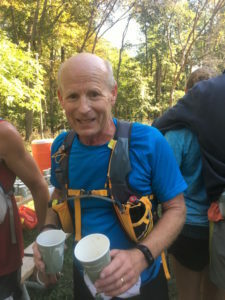 Coming off of the MR340, my coach Scott Gall’s main concern was to get me adequately recovered in the 6 weeks between the canoe race and the run. This meant that there were less back to back long runs then had been in my previous 50 miler training plans. Is it posible to train for a 1/2 marathon and run a 50? The summer training group got started again this summer and so I tagged along with them as they were training for a 1/2 marathon, all the while wondering if this was going to be enough to get ready for what I knew by reputation was going to be a very hard 50! I added a couple longer runs in the 2 1/2 hour range but nothing like I had in my training plan for the last two 50’s. The Superior Fall trail race comes in 3 lengths: a 100 mile race, a 50 mile race, and a marathon length race. The moniker of the race is “Rugged, Relentless, Remote,” and with almost all of the race on the hiking trail it was true enough. At the pre-race meeting at the Finland Recreation Center, the race director pointed out that based on finishing times, the 50 mile race was one of the most challenging 50 milers in the country. Just before the Start at Finland. We started in the dark at 5:00 am. with the first couple miles down a gravel road and then a snowmobile trail in an attempt to sort the race field out by pace. We picked our way through rocks and roots, by the light of our headlamps. It might have been the energy that always comes at the beginning of a race, but apart from the relentless rocks and roots, it was not too physically challenging. This would be a theme for much of the race, plenty would be so technically challenging that it could not be run! The consensus was that this was a race where only 20% was truly runnable, I think that was a little low, but the truth is there was more than 1/2 was not really runnable. I made it to the Crosby Manitou aid station (just short of 12 miles) ahead of schedule and almost ahead of Kathy! I was feeling pretty strong at this point. After a short climb, the trail dropped steeply and crossed the Caribou river. For the next 14 miles the trail climbed, but what often gets missed in Sawtooth mountain terrain is that there were a series of climbs and descents. Trekking poles are all about technique! At about the half way point. There is a whole secondary story that happens on races like this with your support crew. Because it is a point to point race, people come and go at about the same time, as the runners. When I came into the Sugar Loaf aid station, Kathy announced “you should run with Fiona.” I was thinking, I do not know Fiona, or her pace, but she left the aid station about the same time I did. I was carrying trekking poles but had not yet gotten them out of my vest. It took about 50 yards for me to realize that Fiona really knew how to use poles! (She is a crosscountry ski coach from Thunder Bay.) I had been noticing that most of the people I was observing were using them as “walking sticks.” Honestly that was why I decided to bring them myself. But cross-country skiing was my first marathon sport, so I am quite familiar with poling! For the next 8 miles or so I followed Fiona as we poled past plenty of “runners.” Eventually after we had talked through plenty of US politics with Canadian insight, she poled off ahead of me. By the time I got through the Sawbill aid station my pace was lagging. In the last 12 miles of the race there are 8 steep ascents and descents, not counting the smaller climbs. For a while I was hoping to be in by dark, but that was increasingly becoming unlikely. I finished just before 8:00 pm, with just a hint of light in the western sky! 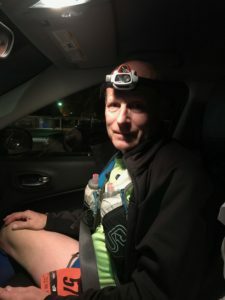 Kathy had given me my headlight at the Oberg aid station and I was needing it as the trail continued to be rough as the light failed. I finished while there was still a little light in the western sky. My time was 14:57:19, that was a pace of 17:57 per mile! It was my slowest 50 miler so far but also it was also the hardest. Paddling near Sunset in the MR340. I have been neglecting paddling in recent years. So when my friend Kent suggested we paddle the Missouri River 340, I did not immediately say no. However, it was a 340 mile non-stop canoe race (!) and whether it was something this 61-year-old body could accomplish was less than certain. 3 as our boat, at 20 feet long, it was enough for one of us to sleep while the other paddled (a feature we never utilized)! We had made provisions for sleep. We chose a 20-foot tripping canoe, instead of a racing boat. We carried a sleeping pad and had practiced with one of us laying in the bottom of the canoe, while the other paddled. 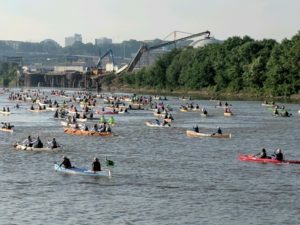 In the end though, it became a flat out race, no sleep for the entirety, of the 42 hours and 55 minutes that it took to paddle from Kanas City to St. Charles. My paddling partner has always been fond to tell me that there is no one who can beat him in a sprint, and I have seen him paddle enough to know that as truth. Still in countless conversations leading up to the race we had talked about the need to stay under control, especially at the beginning. Yet, I knew what was coming when we placed ourselves toward the front at the inside of the corner of where the Kansas River flows into the Missouri and as I might have predicted, we ended up sprinting off the line. One of the two fast 4-5 person racing boats hit us in the stern and spun us almost into the other. Words were exchanged, the long and short of it was that they thought “we didn’t belong where we were.” I suppose it might have looked that way to a focused team who had just hit the sort of boat you might use on a trip to the Boundary Waters, however, what they did not know was that in the bow was a former USCA National Champion. So it became a flat out race… We judged each tandem team that passed us and decided we did have a chance—they were working too hard for a 40+ hour effort! The MR340 starts in 2 waves, 7:00 for one person boats, and 8:00 for the rest. We were hoping to average 7.5 mph (which is a fast pace), but by the end of the first day, we had established an 8.6 mph average. The river was not far below flood stage and the flow was exceptionally fast. When we got to the 3rdcheckpoint at Glascow (141 miles) we had stopped for a total of 2 minutes to switch out empty water jugs. As the day progressed there were 2 other boats in our class that we were trading the lead with. A couple guys in a wood strip pro boat the were switching between canoe and kayak paddles, and a couple of young guys in an aluminum canoe that were making up for the inherent slowness of their boat with an exceptional amount of power. By late afternoon we had dropped the pro boat but the aluminum guys were still in front, we passed them toward sunset and would hold that lead until the next afternoon. We entered the first night of paddling. 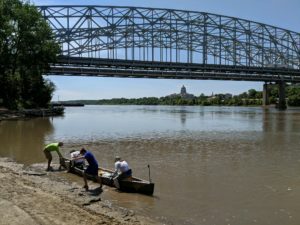 The Missouri River is not without hazards. There are wing dams and floating debris. Because the river was high, submerged navigational buoys would pop out of the water at anytime. Reading the river, which was not all that hard during the day, became uncertain and as fatigue mixed with drowsiness and eventually in the early morning a light fog, gave everything an ethereal feeling. There was a kind of hallucination that all of this created as the intense focus that was required mixed with exhaustion mixed and darkness. We became accustomed to seeing things that were not there! The checkpoint at Jefferson City was 223 miles into the race. we were there at 11:18 (a little more than 27 hours after he start). By morning I was pretty certain that we were not going to finish this race. Kent had thrown up a couple times and was unable to eat or drink. Both of us were catching ourselves falling asleep in the middle of paddle strokes. We would paddle a few minutes and then stop for what seemed like longer. I was loosing both my focus and my desire to continue. At this point we were still the lead tandem boat, but I was fighting the thought that we should paddle to Jefferson City (mile 223) and register a DNF. Instead we stopped for a major resupply, got out of the boat for 15 minutes, and got back in feeling a little better. As we were pulling out, the second place aluminum boat was pulling in, they looked as spent as we felt. We were very much in survival mode when we left the Jefferson City check point. With 120 miles still to go, we decide to focus on paddling in 15-minute blocks, which I promptly upped to 30. I am not sure if that helped Kent, but I did help my focus. 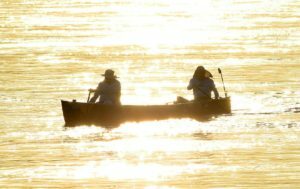 It took the aluminum canoe until mid afternoon to catch us and while we were not feeling all that competitive, both of us had kept looking behind us to see how much they were gaining on us. Eventual we decided to drop our pace and let them pass. After wishing them well, we were able to focus on what we thought was going to be the hardest challenge of the race. We reached the checkpoint at Herman (269 miles) at 5:45 pm. Projecting our time forward, we where looking at the 3-4 am finish and a second night of paddling! Toward evening we decided to increase our intensity as a way to stay awake, and then as late as possible to take the caffeine tablets I was carrying and hope that would be enough to see us through to the finish, This started to feel like a race again as opposed to the death march that it had felt like for most of the day. Our pace and focus improved. Some time around Klondike (mile 311) maybe 11:00 pm we took caffeine and also consciously kept our effort up. 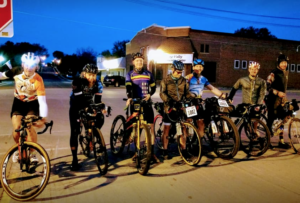 Another factor that helped in the final stages of the race, was that once we got past the checkpoint at Hermann, where there was about 70 miles to go, and our spirits lifted as we once again were able to envision finishing this race! We made it to Charles City just before 3:00 on Thursday, 43 hours and 55 minutes after we had started. 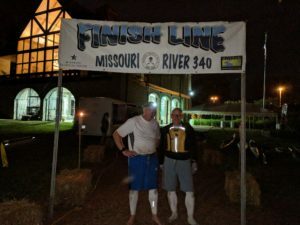 At 2:55 am on Thursday morning, we arrived at the finish in St. Charles. 42 hours, 55 minutes after we began. We were the 14thboat over all, 2ndmen’s tandem, and probably the first boat in without a rudder. We had chosen a Wenonah Minnesota 3 as a boat. It was probably the perfect boat to finish this race with. It was super stable, had the most comfortable canoe seats I have ever sat in for a extended period of time, and it was an efficient design – our average over the entire race was 7.9 mph! a racing boat might have been faster, but we would not have been able to sleep in it (something we thought we would do, but didn’t), and perhaps that was our only significant miscalculation, we had a bigger boat than we needed! Mass Gathering at the NRG stadium in Houston Texas. For the last few years, I’ve been coming to terms with a couple related realities. First, I am a white male pastor in what is pretty much the whitest denomination in the country. Second, I am getting old enough that I am being keenly aware that I will soon be passing on the mantle of church leadership to another generation. As we were leaving the 2018 ELCA youth gathering in Houston and settling in for what would be an 18-hour non-stop drive to get back to Iowa, we passed a statue of an old Sam Houston along I-45. We didn’t stop. The almost 70 foot tall, whitewashed likeness of the person who the city was named was literally a concrete reminder of what I had been thinking about the past week at the gathering, and for the last couple years: what should the role of an old white man be in this church, and particularly in this denomination? Rebekah Brusehoff, an 11-year-old transgender girl with purple hair, followed Bouman. The fact that an 11 year old could stand in front of a crowd of 30,000 is amazing, but that she could articulately talk about what it was like to be born a boy, but be a girl was astounding. The theme for the event was “This Changes Everything,” I found myself thinking that while the planes crashing into the World Trade Center changed the world, hearing from an 11 year old transgender girl was changing everything. Close, but not the same. I found myself thinking that us “old white men” need to start listening more and talking less. On Sunday morning, Presiding Bishop Elizabeth Eaton preached a good sermon on the difficult text of Jarius’ daughter and the women with a flow of blood. It was a good sermon following the reading of the text from the Gospel of Mark. It was a good message in the usual place and how we usually do things in church. Then all of a sudden, Savanna Sullivan was on stage. It was a place in the service where someone normally does not deliver a message. She introduced herself as a former Young Adult in Global Mission. She talked about the time 3 years ago when in the summer after being assigned to a year in Rwanda, she was diagnosed with an auto-immune disorder. Her doctors suggested that she stay home. She described a conversation with her father, where he asked if she was willing to die in Rwanda. It was a question she could not answer. Savanna said that while she wished she could have answered yes, it was not the answer that came to her. She said she cried ugly tears that night and the answer came to her: going to Rwanda was not something she was willing to die for, it was something she was willing to live for. In this juxtaposition, I found myself realizing that not all the “old white man” are actually men. There is an establishment of power that gives privilege to some, myself included. It is not always a power that is abused and I certainly did not think that listening to Elizabeth and Stephen. Yet, if the Gathering showed me anything, it was that we ought not presume to speak for others; instead, we need to empower them to speak. One of the many people I ran into at the Gathering was my dear friend AJ. I remember the conversation when she was discerning that God might not be calling to use her finance degree to sit in an office and just make money. I remember her YAGM experience. I remember marrying her and her wife Carley a couple years ago. I remember being careful not to ask the bishop’s permission. I remember not being the most forthright about her sexual orientation when she came to preach at the congregation I am currently serving. It was not really my truth to tell, it is theirs! There were 7 starters in the 2018 Alexander 380. 3 would finish. Earlier this spring one of my 7thgrade confirmation students upon learning that I was headed to Arizona to run a 50k, asked the question few ask me out loud. It was a one-word sentence: “Why?” I am not really sure there is an answer, at least not an answer that many would understand. People might exercise for their health, they might try to break some record, personal or otherwise, but at age 61 I have pretty much given up on either. The truth is I do ultra-distances simply because I can, but I am not sure that really is an answer to the why question. I had a late start into the world of endurance sports. I was not a kid who was interested in sports in high school. My family didn’t pay attention to traditional sports, and I frankly was not good enough. When I attend high school track meets I always feel empathy for that kid who is so far back they look like they must be in another race. I was that kid, in track, the only sport I ever even attempted. I was in my 30’s when skied my first 50K, 44 when I ran my first marathon, and 60 when I ran my first 50-miler. But it was different. Those were never races I was going to win; those were races where I would never even get noticed. As a result, I have tended to find groups that would notice: Skiers doing the same races; bike groups that gather to ride together; a group doing the same race. There might be some shared training, but more there was a shared focus, a tribe of like-focused folk. For whatever reason, I don’t really have a tribe right now, and I am old enough and experienced enough to know that tribes of this sort are a gift in the present that tend to disappear. Most endurance sports are solitary in a way, but oddly for me, it is being a part of a group that has always drawn and grounded me in endurance sports. Perhaps because there are so few people who understand, much less relate to this sort of endeavor. Having a group that understands has always been an important aspect of this for me. Perhaps it is related to not having a group to focus my efforts, but being alone in this has meant that setting the bar higher and further was almost impossible not to do this year. I was almost bound to find my limit. Two 50k’s so far this year, the Alexander 380 gravel bike race, the Missouri River 340 mile canoe race, and the 50 mile Superior Trail race. Something on this list was certainly bound to bring me close to what I could physically and mentally be able to accomplish. I found that limit this weekend. At 2:30 am, 190 miles into the 380-mile gravel race, I decided it was time to stop. It was dark, and wet, the steep down hills were increasingly looking like a crash waiting to happen. My focus, balance, and small muscle motor skills where failing, after 21 hours of pretty much continuous effort. I stopped knowing and learning from poorly made choices in past similar situations: There was the cross country ski race where I froze a couple fingers so badly they turned black and I thought I would loose them. There was the marathon where I ran 13 miles after I felt my tibia break. Deciding to stop was sort of remarkable for me. Crossing into Wisconsin at mile 126 or so. average 61 year old, and lower my activity level to short walks and occasional bike rides on paved trails. To me, that would be quitting. Stopping was a matter of deciding if the potential damage was worth the risk. For me on Saturday morning, it was not, but it was also not a place to quit. I was stopping, not quiting. Can I look back and figure out how this might have unfolded differently? Of course! We could have found a place at sunset and slept for a few hours (we had the gear along) but that is surprisingly hard to do at 1:00 am when it is dark and raining. I could have better thought through my rather ridiculous weekend schedule (I had to preach on Sunday morning). It is always amazing how clearer things are in hindsight. I had been posting my progress on social media, and that meant I needed to let folks know that I was stopping. The first of many supportive comments came from Gary Jones: “With age comes wisdom. Live to race another day my friend.” Perhaps I have more of a tribe then I think. Waiting for the start at 5:00 am. I registered for this race knowing that it would be a challenge. In fact, a month or so out I was thinking it was perhaps too much of a challenge! 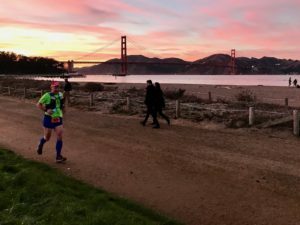 The California version of this TNF Endurance Challenge is located in the Marin Headlands north of the Golden Gate Bridge, and it has what Iowa does not really have: “drastic elevation changes,” as the race description says, along with views of the Pacific Ocean, the San Francisco Bay Area, coastal scrublands, redwood trees and eucalyptus groves. The good news is that while there would be a lot of climbing and descending, there would not be much altitude to contend with because the race literally begins and ends at sea level. That said there were 9 major climbs and descents of 500 to 1,900 feet and the race ended with a run across the Golden Gate Bridge. My coach Scott Gall had been out here a couple times for this race and so I relied on his recommendations. 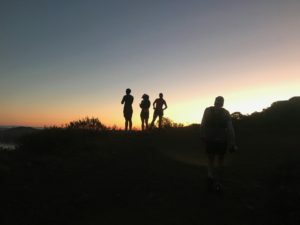 The race started at 5:00 am so the first couple of hours were run in the dark on fire lanes in the Marin Headlands. The Petzal nao+ headlamp I used was fantastic, and starting early meant that we started a couple hours before the sun rose. Because it was a clear day, we got to experience the sunrise in all of its glory! The fire lane portion of the run continued for most the first half of the race, ending with a section of single track switchbacks up to the high point of the course, an aid station appropriately name Cardiac. My plan was to run this race based on heart rate staying in stay in zone 2 or lower at least for the first 2/3 of the race. That meant that I walked up plenty of the hills. Scott had told me that the hardest part of the race came in the second half and that was true enough! Leaving the Cardiac aid station at mile 23 the trail switched to a steep downhill single track. This was a 1,900 ft descent to the Pacific ocean with most of the slope in the last mile and a half. 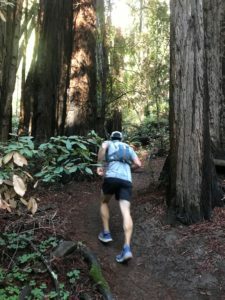 I found myself appreciating the downhill treadmill workouts that were the focus of much of the last month of my training, as I was able to maintain my speed downhill through some fairly complicated single track. Running through the redwoods after mile 30. The Stinson Beach aid station was at the bottom of the hill and my support crew was there to meet me. I was feeling strong and exhilarated at this point. That was good because the climb back to Cardiac from Stinson Beach was even steeper than the descent. The second time through Cardiac brought me to a little more than 30 miles and to that place where I might start to fade. Leaving Cardiac, the trail was mostly single track through some beautiful old stands of redwood trees. By this point in the race I was hanging with pretty much the same people and probably because we had all been doing this for 8 hours at this point, we started to pace each other. So thanks, Cassie from Brooklyn NY. Your conversation and the 400 mg of caffeine I took at mile 30 made that next 10 miles among the most enjoyable of the race. The trail went to another aid station we passed through in the morning, Muir Beach, and then up a steep fire lane we had run down in the morning, before coming back to the Tennessee Valley aid station where I again saw my support crew. 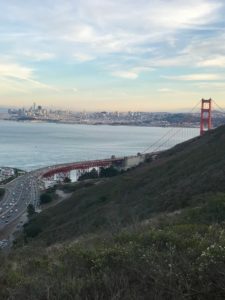 From there, it was a climb back up the headlands to the Alta aid station and from there a more-or-less down hill single track to the parking area on the north side of the Golden Gate bridge, a run across the bridge, and then another mile or so to the finish at 50.8 miles. The final single track before the bridge. There were some I heard on the trail that thought finishing a trail run with a run across the Golden Gate Bridge was not really in the spirit of trail running, but I thought it was great. You could see the bridge come into and out of view, growing larger and larger each time until the trail became a wonderful side slope single track that brought you down to the bridge filled with all sorts of people doing the things that people always do on the bridge, walking leisurely, taking pictures, standing in the way of others, almost none of them knowing that we just ran 50 miles to get there. Coming into the finish of The North Face Endurance Challenge after 12 hours of running. I am not sure that my renaissance interest in running is related to my aging, but it might be. Today I am 60 and I realize just how privileged I really am. I am privileged in a lot of ways, but I am especially gifted in being physically able. When I was young, I was not particularly fast or strong. When I ran track in junior high, pretty much everyone was faster than I was. When I raced cross country skiing in my 30’s, I was far from exceptional. In my mid 40’s when I ran my first marathon, I was a finisher. But lately, and I think it is a kind of attrition, I have been finding myself moving up among my peers, I think that is partly because I am still doing it while others have given it up and partly because I am pushing myself more than I once did. Before the last lap of the Runners Flat 50k, Fall 2016. I am registered for the Ice Aged Trail 50. It is a 50 mile trail race in La Grange Wisconsin. I have never ran that far… ever. Back when my friend Steve Schuder was running 50 milers, I was both in awe of his abilities and convinced that I would never attempt such a feat! So here I am a couple weeks out with my training on track and on this day of my birth I find myself wondering why I would consider such a thing at 60? I am not the only one. A couple weeks back we were in the Runner’s Flat in Cedar Falls. One of the owners, Scott Gall is my coach. As I was looking at something, I could hear my wife Kathy pull him aside and quietly ask him if he thought I could really do it. I think in the end, I keep increasing the physical challenges because I can. My father died when he was 45 that left a mark on me. I remember being about 42 and simply assuming I better get my life in order because I might only have a few more years to live. Well 45 came and went and while I don’t really think of it all that much, when a friend mentioned that 60 was the new 40 a few days back, I have to admit that is what came to mind… my mortality, the fact that eventually my health will decline and eventually I will not be able to continue to raise the bar of the physical challenges that I place in front of myself. For me, physical challenges give me life and motivate me to stay physically active, that provides the life and the energy that sustain me. Because of the general oddness of how life has worked for this 60 year old, I am still setting personal records when most of my peers have already entered the stage of diminishing returns. So on Mother’s Day weekend in Wisconsin, probably for most of the day, I’ll be running for the joy of it, and because I still can. It is true enough. This past Sunday, we baptized our youngest member and not long ago we buried a long time member Yes, for those of us who connect ourselves to places like this, it is where the world begins and ends… but what about the space in between? The family I grew up in attended worship every Sunday, as did the family Kathy and I raised. While I would like to say that on account of that habit we all still attend worship regularly, it would not be true. While I would eventually go on to become a pastor, for my sister, church attendance would be driven more by the influence of her children than it would be by the imprint of her early childhood experience of regular attendance. Our own children look to be following the same path. None of them attend worship regularly. I think they all would say that Christianity is important to them but it is just that worship is not the central feature in their lives that it once was. Perhaps my family is a projection of what is happening across the church and across Christian culture. Worship attendance is decreasing in priority. If we are honest, it has been for a long time. I find myself wondering what that might mean for faith. 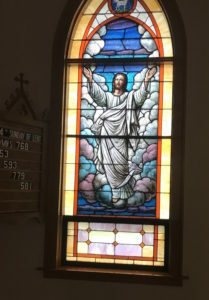 It seems that Christianity at least in the way increasing numbers of folks, participate in it, is becoming unsupported. For increasing numbers of folks things like worship attendance, Bible study, and acts of service have been replaced by a vague sense of “being a Christian.” What used to be a matter of community is increasingly becoming a matter of personal religious conviction. Our culture has facilitated this reality. I grew up in the era of televangelists, where a televised preacher could allow us to experience worship from the comfort and safety of the sofa in our own living rooms. While this experience was roundly criticized by the established church, it flourished. With the advent of electronic media, you can now find an almost infinite collection of sermons on YouTube that are better than anything I might preach. Music that fits your preference and is better than anything we can produce here is just a search on Spotify away and any theological question you might have can be answered quickly with a simple Google search. But all of it is personal, delivered to your mobile phone or personal computer whenever and wherever you would like. What seems to have become optional though is what I thought was key to Christianity. Faith is meant to be lived out in community. I am not sure what that means in a world that is increasingly busy. I understand. People are busier than ever. Even if there isn’t a direct conflict on Sunday mornings, for many it is one of few times when they might be able to find a little quiet family time to spend together. I am asking this as an open question to which I do not yet have a satisfactory answer: What is it that binds us together as a people of faith? It once was worship. I think that is still true for some. But increasingly I find myself wondering what it is that binds us together. The church is about baptisms and funerals, true enough, as my mother reminded me- “where the world begins and ends.” Throw in confirmations and weddings. Still, what should the space in between look like? I used to have a good idea about that. Lately I am finding myself revisiting even the most basic of these assumptions. What I am about to suggest is something that might be considered heresy. At least it is not the sort of thing that a pastor might want to admit, given that we see our sermons as the Word of God, and consider the active party in much of what happens in terms of faith to be a matter of the Holy Spirit. But you see, it affects me when you are not here. This is a small enough place that I can literally see and feel your absence. This past Sunday morning, I looked out on the congregation as I was about to read the Gospel and did the silent assessment that I have been undertaking on Sunday mornings lately. Were there enough children present for a children’s message? Given the way I approach preaching, and seeing that there were not, it is not really all that traumatic of a reality for me. I simply incorporate the children’s portion of the message back into the part intended for the adults. Still, that you are not here is troublesome for me. I came to this parish because I was increasingly sensing a call to minister to families. I suppose that is a little odd that an almost 60 year old would see that as a ministry niche that he might be called to but it was and still is. I have sensed for some time now that we live in a time when families are increasingly becoming spiritually adrift. So much competes for your time and attention. I came here because I sensed this was a place that was not so far post-Christian, that there was still hope for some of the old structures and that there would be the time and interest in developing some new ones. I have found myself wondering about that lately. Worship has always been the highest profile expression of a parish pastor’s ministry. It is the place where each week, the Gospel is proclaimed in the context of people who have gathered. Don’t get me wrong. People still gather. It is just that you are not usually there and it has me wondering. My approach to worship is to make it assessable and family friendly. My sermons are short enough that even the most drowsy ought not fall asleep. I deliberately choose not to preach from the pulpit so that my sermons might be more like conversations then dissertations. I sometimes wear a robe and a stole, but often I do not. I never wear clergy shirts. All of this is done to lower the formality of the affair. I am not sure if any of this really works, but it is my wish that worship be approachable, assessable, and informal enough that it is not something that is stressful to attend. It is true enough that worship is more or less predictable and maybe not as exciting as it could be. Sometimes my sermons miss the mark. The hymns are sometimes not well known and too slow. The contemporary service isn’t all that contemporary and it’s at 8:30 in the morning. I come from a different reality than many of you. For the family I grew up in, and the family that Kathy and I raised, worship was the central touchstone of our Christian faith. I understand that there are plenty who question the centrality of worship in the digital era in which we live. I see busy families with all sorts of competing commitments of which worship is simply one among many. That is a paradigm shift for me, but paradigms can and do shift. What I am not willing to do is to sit back and gently head toward retirement watching the church die for lack of asking what we can do to make it relevant in your lives. How and what should that look like? That is something that we will have to discern together. I did not think I would be one of those fathers who would cry it his daughter’s wedding. I am not sure if this is because Kaia is the first of our children to get married, if it is because I was completely outside of my considerable wedding experience, or if it is just what happens when your child marries. I do not know. I always tell couples to be ready for the range of emotions that a wedding brings—happiness and sadness, joy and mourning. I just thought I would have been somehow immune from this reality, having officiated at more than 100 weddings in the past. I was wrong. Perhaps some of that is explained in this wedding experience being something completely different. I never have been a part of a wedding that began with a procession lead by a couple of dancing lions and ended with a fire-breathing Sichuan face changing opera performer. Or a wedding that involved my daughter riding in a Chinese wedding sedan, jumping over fire, a 3 fold bowing ritual, a tea ceremony, a hair cutting ceremony, and a place where we threw peanuts and dates on the bride and grooms’ heads. 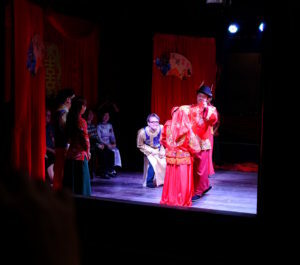 The traditional Chinese wedding has considerable drama. This wedding was a mixture of the playful and the serious. And while most of it I did not really understand, there were some surprising elements. Kaia and Siheng knelt and bowed, first to the god of heaven and the god of earth, then they bowed to their parents, and then they bowed to each other. That seemed oddly familiar. I do not think I have done a wedding where I did not talk about the contribution God makes, the significance of family and friends make, and the commitment made to each other in my sermon. There has never been a Facebook post I have made that has had this many likes than the one I posted after the wedding, but here is the thing: there actually have been a relatively small number of my clergy Facebook friends who have hit the “like” button. I understand this. This is a wedding that is way outside of our religious norms—being more-or-less secular, celebrated in a communist country on the other side of the world. This is a wedding that is way outside of my cultural and religious experience as well, but for me it was given with my being Kaia’s father. I think parents always find this out that about their children. They have their own values, make their own decisions, and they follow their own paths. Cross cultural experiences get so complicated so fast that they pretty much defy your ability to make any kind of sense of them. I think that is true for the most part, but even more so if you constrain yourself to the forms and procedures with which you are familiar. As a pastor I meet with couples and we talk about what might and might not be in their service. While I am the one who sort of “maintains” the tradition, I am pretty open to the possibilities, there are limits: I have a problem with over head wedding veils. I make sure that the bride knows that while her father might walk her down the aisle, she is not her father’s to “give away.” I pretty much refuse to present the couple as Mr. and Mrs. (insert groom’s last name), because she is not a subset of him. Still in the end, weddings are about a shared commitment, and at least in this world, I am reminded once again that I am not the gate keeper.